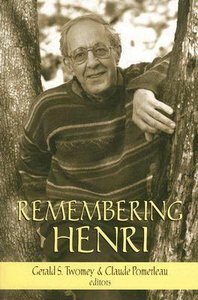 Ten years after his death in 1996, Henri Nouwen remains one of the most popular and influential spiritual writers of our time. What accounted for his strong personal impact on so many people? The memories, anecdotes, and reflections collected here, all by people who knew and worked with him, shed light on the meaning of Nouwen's life, the diverese facets of his complex personality and the nature of his enduring legacy.